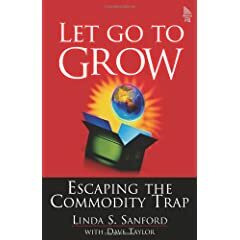 Linda Sanford and Dave Taylor have a new book entitled Let Go to Grow: Escaping the Commodity Trap which focuses on how to organize your mindset and development processes so that you con continually innovate in ways that will prevent your products and services from being commoditized. Deregulation, globalization, and the Internet are driving rampant commoditization in virtually every industry. To escape that trap and grow profitably, you must "let go" of traditional control mechanisms. In their place, you must build new models, relationships, and platforms that capture and deliver value from multiple sources, inside and outside the enterprise. In Let Go To Grow, IBM senior executive Linda Sanford and long-time entrepreneur Dave Taylor show exactly how to do that. Sanford and Taylor systematically review the On Demand Business processes, people strategies, technology shifts, governance practices, and leadership vision you'll need to maximize profitability in tomorrow's business environment. They introduce powerful new techniques for balancing and measuring three key drivers of top-line growth: productivity, collaboration, and innovation. You'll discover how to gain unprecedented flexibility by constructing your business around components, platforms, and standardized interfaces. The authors demonstrate how to expand your growth space, liberate your cost structures, and build profitsnot just revenues. Drawing on the experiences of companies ranging from GE to eBay, Toyota to IBM, this book focuses on practical implementation, offering a proven, start-to-finish approach for moving from vision to results. BTW, I do get a tiny commission if you buy the book after clicking on my link to Amazon. Clue us in: what's wrong with this picture?